3.6.15 – NEW YORK, NY – Ten climate activists have been found “not guilty” of criminal charges stemming from the Flood Wall Street protest. New York City Criminal Court Judge Robert Mandelbaum ruled that the NYPD’s order to disperse violated the First Amendment. Following the historic September 21 People’s Climate March, several thousand people took to the street in the Financial District to identify and protest against Wall Street’s central role in fueling climate destruction. At the end of the day, 102 people were arrested for sitting in the street at the intersection of Broadway and Wall. Ten of the arrestees subsequently decided to fight their charges in court. In his ruling, Judge Robert Mandelbaum found that the NYPD’s order to disperse was unlawful, and that by ordering protesters to leave the entire Wall Street area, police violated protesters’ First Amendment right to carry their message directly to its intended recipients: the Wall Street bankers who bankroll climate change. Defense Attorney Jonathan Wallace successfully argued that the Constitution protects citizen’s rights to express political speech within proximity to the target of the protest. In this case, the NYPD first prevented protesters from entering Wall Street before later ordering them to leave the area altogether. This pattern of policing proved to be the Prosecution’s undoing. Judge Mandelbaum also broke new ground by taking judicial notice that climate change is happening, is a serious problem, requires immediate action, and is caused by human activity. 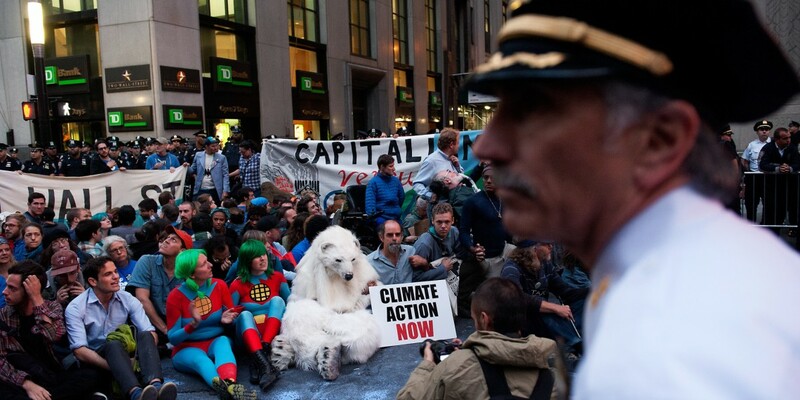 Today’s ruling vindicates Flood Wall Street’s political message and sets an important legal precedent for asserting the constitutional legitimacy of mass civil disobedience actions protesting climate change. All ten defendants gave passionate testimony to the court, stating their convictions for attending the Flood Wall Street protest and affirming that their actions were justified. “I was proud to be arrested standing up for what was right, and it was good for the community, the environment, and the planet ,” said Lewis Chiu, a 39-year old data analyst who was arrested at the sit-in. “Of major significance is the fact that during the trial the judge took ‘judicial notice’ that climate change is a serious problem in need of being addressed in an urgent manner,” said Susan Heitker, one of the defendants. “Wall Street companies fund and profit off disaster for all us, and finance capitalism won’t be able to deal with the social fallout of climate change. We urgently need to act to save our planet and futures,” said Jason Woltjen, one of the defendants.